Radio doesn’t get enough attention these days unless it’s coming from a smartphone. That’s why we love this app from WNYC, or, New York Public Radio. The app is a great way to live stream some of our favorite shows, including Radiolab, Freakonomics, All Things Considered, and more. There’s also a handy feature that allows you to allot a certain amount of time for the stream to download. Going underground for 30 minutes? The app will retrieve and download a stream for 30 minutes. 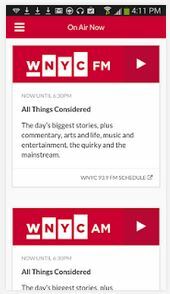 Join the New York conversation with the WNYC app. You’ll hear live streams of the best news, commentary, cultural reporting, storytelling and music from the world of public radio. 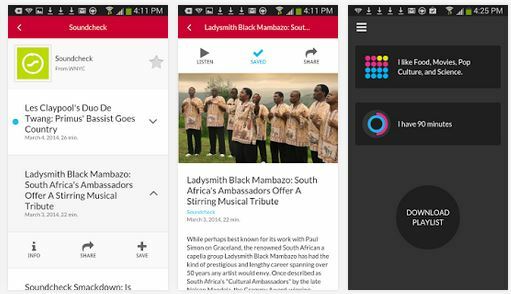 You can browse our on-demand shows, save them to your playlist and keep them for offline listening. With the new feature Discover, tell us what interests you and how much time you have and we’ll download for you a custom playlist of segments from the best shows in public radio. In addition, you can read the most timely, most talked-about local and national headlines from WNYC, NPR and other sources. WNYC is the flagship public radio station of New York City. We produce a range of original and innovative programs and podcasts, including The Brian Lehrer Show, The Leonard Lopate Show, The Takeaway (a co-production with Public Radio International) and, from our newsroom, award-winning local and national reporting. Soundcheck, New Sounds and Spinning on Air feature exclusive performances from the new music scene, while Jonathan Schwartz is the voice of American standards. If you’re at home looking for local and international stations, you should definitely check out Radio Search Engine.